Starring John Hurt, Sofia Helin, Max Brown, Erin Richards, and Charles Dance. An aging screenwriter learns that he is terminally ill and seeks to put his life in order before bringing it to an end at a time of his own choosing. 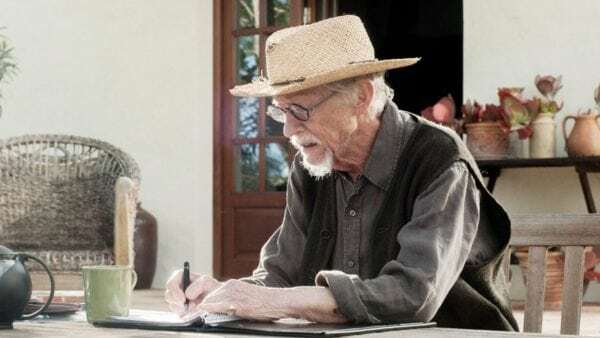 Sir John Hurt was a wonderful actor who almost always worked in the margins. Here, in his final performance, we see a rare spotlight put on Hollywood’s nearly perpetual supporting man. In That Good Night, a title taken from the Dylan Thomas poem “Do not go gentle into that good night” and based on the stage play by N.J. Crisp, Hurt stars as Ralph Maitland, a famous screenwriter who has just been informed that he is terminally ill.
As we are introduced to him, we quickly learn that Ralph is not a very pleasant man. He is a bit of a curmudgeon, but not unlikable. He lives a quiet life in a beautiful villa with Anna (Sofia Helin), his much younger wife. We learn very early about his terminal illness, though not exactly what it is, and the film becomes maudlin almost immediately, in a way that doesn’t feel quite earned. Ralph calls his son, from whom he is estranged, and demands to see him as quickly as possible. When his son Michael (Max Brown) arrives with his girlfriend Cassie (Erin Richards), we learn of the reasons for their estrangement. Ralph is not only a curmudgeon, but incredibly unkind and uncaring, spouting vicious remarks toward Cassie in every interaction they have. He blames her for his inability to have a private conversation with his son, despite ample opportunities to do so, all of which he squanders by quibbling with Michael. Amidst these quibbles, we learn that Ralph has mostly ignored Michael his entire life, and had abandoned Michael’s mother. Because of the incessant barbs, Michael and Cassie leave without the discussion Ralph longed for with his son. The interpersonal dynamic created by these four draws you into a film that is otherwise relatively bland. 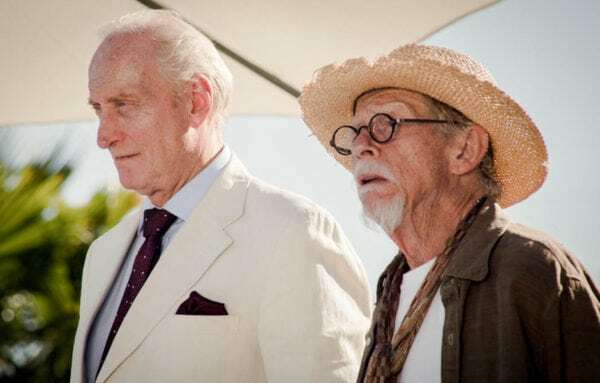 The introduction of Charles Dance, playing a character known only as “The Visitor” who works for a clandestine organization known only as “The Society,” livens the film up a good bit. We see Ralph making contact with the Society shortly after learning of his condition, and Dance arrives at his home shortly after the initial departure of Michael. From this meeting we learn that the Society is a group of individuals who believe very strongly in the oft maligned practice of euthanasia. They believe that a human being should have the ability to choose the moment of their departure and that “life at any cost” is a notion that often promotes suffering. However, we learn from Dance’s character that they do not take lightly a decision that has so final an outcome. When he suggests to Ralph that he seek therapy, or at least take a few more days to think about it, Ralph demands that it be done right away. Instead, the Visitor administers a serum that puts Ralph to sleep. When he wakes up, he is not disappointed. For the rest of the film, the consultations between Ralph and the Visitor continue intermittently. Michael returns to speak with Ralph at the behest of Anna, who suspects that Ralph is not well. When he returns, Ralph finally reveals that he hasn’t much longer to live. Michael then shares the news that Cassie is pregnant, and that they intend to marry. Upon learning that he is to be a grandfather, Ralph gives up on the notion of euthanasia and decides to fight to live long enough to meet his grandson. Not much can be said for the direction of Eric Styles. The filmmaking surrounding some wonderful performances leaves a lot to be desired. The camera is strangely and nauseatingly in constant motion. The worst Michael Bay action flick has more still shots than this film. This isn’t to call it an ugly movie. On the contrary, it’s often too beautiful. Cinematographer Richard Stoddard shot the hell out of this movie. “Overdone” would not be an unfair term. Tonally, as stated before, it becomes maudlin and self-serious long before it earns it. It certainly earns it before all is said and done, though entirely through the sheer force of Hurt’s performance. With a less captivating actor in the lead, I’d have likely found it difficult to stay awake, let alone felt any stake in the outcome of these events. 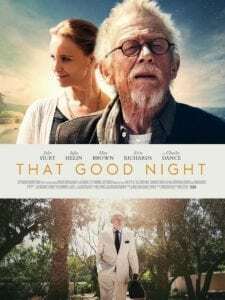 As a showcase for John Hurt, That Good Night is easy to recommend. A fitting final performance as he tackles the concept of mortality. The handful of sequences where Hurt and Charles Dance play off of each other are worth the price of admission alone. Competent support performances give Hurt everything he needs to make his character compelling and worth the emotional investment. Taken as a whole, it isn’t a very remarkable piece of cinema.